The first recorded earthquake in the history of Nepal took place on June 7, 1255 AD. According to records, one third of the total population of Kathmandu was killed, including AbahyaMalla, the King of Kathmandu valley. Numerous buildings and temples of the valley were entirely destroyed while many of them were severely damaged. The magnitude of the earthquake is said to be around 7.7 on the Richter scale. Around 1316 BS/ 1260 AD, the next recorded big earthquake occurred during the reign of King JayadevMalla. Many buildings and temples collapsed and many more were severely damaged. In 1408, another major earthquake hit Kathmandu in the month of August/ September. The temple of RatoMatchendranath was completely destroyed while many other temples and buildings collapsed and were damaged. Cracks on land appeared in many places. The 1681 AD’s earthquake was another major quake that occurred reign Sri Niwas Malla was king. During the months of June and July of 1767 AD, another significant earthquake seemed to have hit Nepal. Twenty one shocks and aftershocks of this particular earthquake are said to have occurred in a span of twenty four hours. During the reign of King Girban YudhaBikram Shah, in the months of May or June, twenty earthquake shocks in total were felt in Nepal in 1810 AD. In 1823, another earthquake hit Kathmandu Valley causing heavy loss of life and property. Similarly, in 1883, two major earthquakes struck Kathmandu Valley. According to records, houses, temples, and public shelters collapsed. The tower of Dharahara was also severely damaged. Four major earthquakes were felt in the months of June and July of 1834 AD. These earthquakes destroyed or damaged many buildings and temples. On 1934 January, a major earthquake, known as the Great Nepal-Bihar Earthquake, struck the Kingdom of Nepal and its surrounding areas. The magnitude of the earthquake was 8.3 on the Richter scale. The casualty figures were the highest for any recorded earthquake in the history of Nepal. In total, 8,519 people lost their lives. A total of 126,355 houses was severely damaged. Some 80,893 buildings were completely destroyed. Since then, the population of Kathmandu Valley has gone up. Urban development and inadequately planned construction practices have compounded the relatively unsafe living arrangements. In 1998 there was also an earthquake in Nepal. It killed over 721 people, affecting lives in 22 districts. As has been reported around the world, a powerful earthquake of 7.8 magnitude shook Nepal on the 25th of April 2015 causing many human casualties and destroying many of our near and dear historical sites. A second powerful earthquake less than three weeks later, on Tuesday, 12 May, spread panic throughout Nepal. The new 7.3 magnitude quake was centered 76 km (47 miles) east of the capital in a hilly area close to the border with Tibet. We from the Asian Hiking Team would like to express our deep condolences to the bereaved families and pray for the departed souls and their family members left behinds. The death toll has reached 8702 including 3899 male and 4801 female so far. The number of disappeared stands 366. Similarly, out of 22,220 injured, 5996 are undertaking medical treatment, according to the data provided by the Ministry of Home Affairs. The quake completely destroyed 505,745 private houses and 14,433 governments. In addition, according to the Ministry of Information, 279,330 private and 3306 government buildings suffered partial damage. The number of displaced persons will exceed over 500,000. Nepal is celebrating the Earthquake Day on January 16, to remember the loss from the great earthquake of 1934; nobody could predict that another disaster would cause even greater loss of lives and properties as the most recent one. Not many people in Nepal realize that Nepal is among the high risk countries in terms of earthquake occurrences. On the other hand, there is the need to find out more about the reasons behind this and how to deal with future damages if Nepal is hit by another devastating earthquake. Though our country is going through a tough time right now, life has to go on. This could in fact be an opportunity for Nepal to grow stronger and better than ever. One of the unique ways to help Nepali people and Nepal as a whole at this difficult time is by visiting Nepal. Because whatever you spend on your visit will directly benefit Nepali people who are living in remote disaster villages and who have suffered the most. Asian Hiking Team organizes trekking in earthquake disaster areas to see the disaster historical building, local villages, temples, Durbar, stupas, monastery and thus assisting those areas struck by natural disasters. Here, we design an itinerary that would bring you to Barpak village, the point of the earthquake, to continue trekking to Laprak village, on to Machhikhola and all the way to Aarughat Bazar. If such itinerary does not match your interest and time frame lets us know and we will take you others affected areas such as Sindupalanchok or Dolakha or Rashuwa. This trek is organized as full board camping or basic shelter stay. Day 02: Full day historical earthquake disaster area sightseeing such as Kathmandu and Patan Durbar square, Pashupatinath Temple and Monkey Temple, transfer to hotel, overnight Kathmandu. Day 03: Early moning drive to Prithivi High way all the way to Gorkha Bazar, 5 hours (141km), visist earthquake disaster historical palace Gorkha Durbar and Kalika Temple, overnight in Gorkha Bazaaar. Day 04: Early morning drive to (off road) Baluwa, 3 /4 hours and walk to Barpak 3 hours on trekking, overnight in camp. 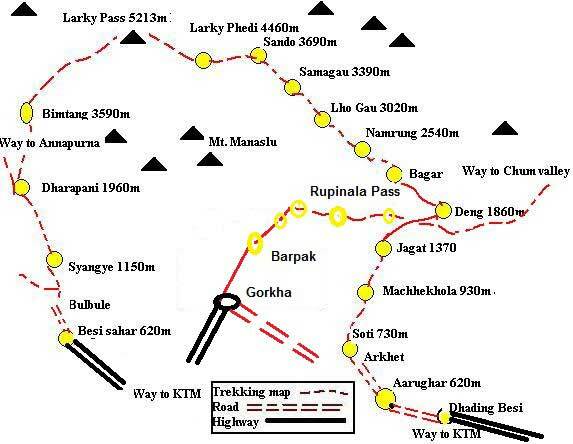 There is seasonable road ride to Barpak if possible we continues go to Barpak village. Day 05: Visit Barpak village, help for locl people if possible, Observation the area, overnight in Barpak camp. Day 06: Trek to Laprak 4/5 hours, visit the disaster area, overnight in Camp. Day 07: Trek to Machhakhola, 5/7 hours, obser the disaster and overnight in Camp. Day 08: Trek to Sotikhola 5 hours and take bus to Aarukhat Bazaar 1 hour dive, visit the Aarughat disaster and overnight in Camp. Day 09: Drive to Kathmandu by local bus 5 hours drive, rest of time relax and last minutes shopping, overnight Hotel. Day 10: Departure from Kathmandu to your own way journey or next trip in Nepal. Trekking Guide and necessary Porters. Trekking Equipments and Insurance for our staffs. Trekking equipments such as Sleeping Bag, Trekking polls etc. National park or Conservation permits if needed. All land transport by Local or Tourist bus.